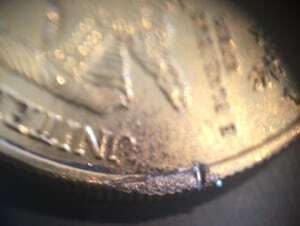 Picture of the fake coin where the edge has been filed to expose the core of tungsten. Goldcoinbalance.com has discovered a fake Gold Eagle one ounce that passes the tests for weight, size and thickness. Our GoldCoinBalance Guarantee has always stated that we would pay the spot gold price for any gold coin that passes all three tests of the GoldCoinBalance. We were so confident in our product’s ability to spot the fakes we offered this guarantee. However, we recently received a coin and letter from a customer who had purchased a Gold Coin that passed the tests, but was a FAKE Tungsten Coin. So unfortunately, we can no longer buy Kugerrands or American Eagle Gold Coins that pass the Goldcoinbalance tests. Someone is making Tungsten core fake coins that do pass the test!!! Buyer Beware!! First let me say the Gold Coin Balance is a great tool and has helped to easily identify over 10 gold coins as real in just a few seconds. It has also helped me to identify 3 fakes along the way too. The tool has saved me from being scammed for over $3,500. The reason I am sending this 2003 American Gold Eagle to you is because it passed all 3 tests on the Gold Coin Balance, but still does not look 100% correct. 1. There are small bubbles or bumps on the coin. These are very noticeable under a loop but I did not examine it that closely when I bought it. 2. Lady Liberty’s face does not display the detail that all my other American Gold Eagles do and almost looks to be sunken or skeletal. 3. The date looks too high off the coin when compared to other American Gold Eagles. I measured it with a micrometer and the dimensions check out within specification, also the weight is right on too. I also did a scratch test and it did hold under 22k acid. I am hoping this is not the first round of tungsten fakes coming from China. I also may be over reacting on these slight differences but it has become enough for me to send it to you. I thank you for your time and great guarantee you give with your product. What does this mean? That someone is trying to destroy the gold coin market and hence gold? Up to this point, nobody has been able to use Tungsten to create a fake coin because it is too brittle to be stamped. Now that I have exposed the fakes, the cat is out of the bag and we will soon provide a tester to catch these fakes. In the meantime please look at 99.9 gold one oz coins. We continue to buy any thought to be fakes that are in this category. We will continue to monitor this situation, and will let you know more as we know more.